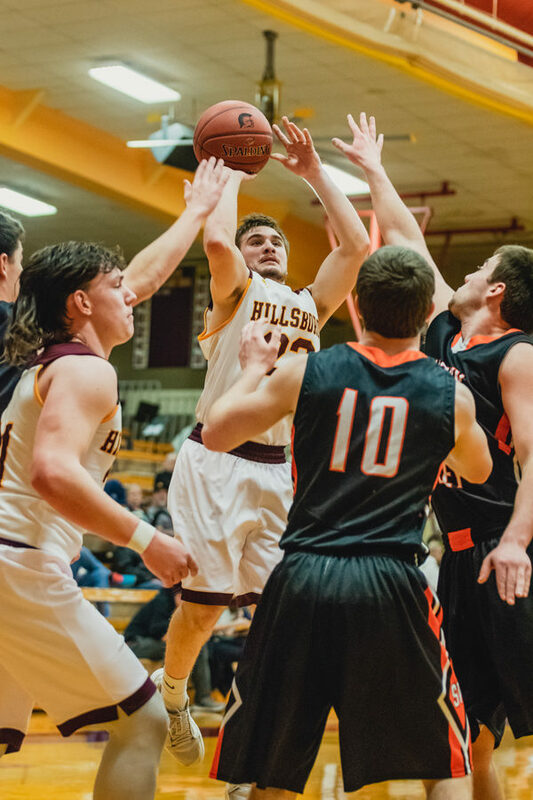 The Hillsboro Boys Basketball team dominated start to finish to get a good win against Hesston in Central Kansas League play last Friday, 50-39. The Trojans wasted no time getting up on Hesston, going up by 10, 14-4 in the first quarter, and then closing out the half with a commanding 25-16 lead. Hillsboro traded Hesston baskets most of the second half giving them a nice victory on the season. Matthew Potucek led the Trojans with 15 points, four rebounds, and six steals as one of three Trojans that were in double figures for the game. Wes Shaw, 11 points and eight rebounds; Darian Ratzlaff, 11 points and three assists, were the other two while Caleb Potucek chipped in nine points, four rebounds and three assists for a nice game as well. “Wes (Shaw) was dominant inside. He contested shots, rebounded well and did a nice job offensively. It was great to see Matthew Potucek play so well. He scored a career-high and played great defense,” Knoll said. Coming – The boys played Halstead away on Tuesday. They play Larned at home on Friday. The game will start after the girls finish up their game.